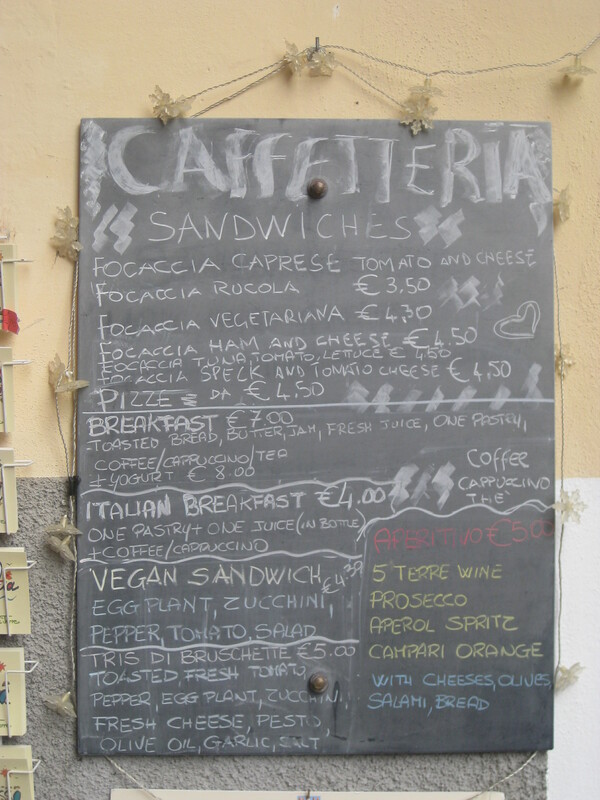 I was super excited to visit the Cinque Terre after leaving Bergamo, if a bit anxious about the vegan situation there. 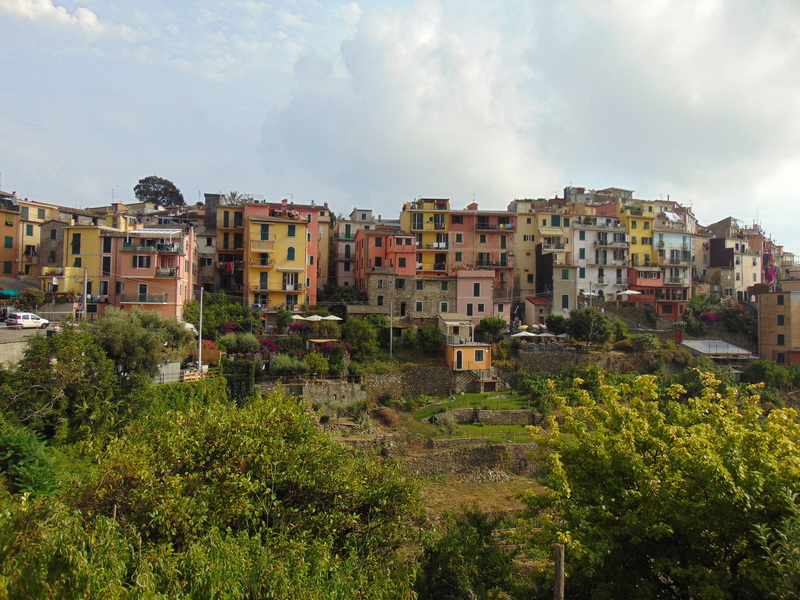 We arrived in the early evening, and decided to get the train from our accommodation in La Spezia (not one of the five villages) to Corniglia (the middle village) because we knew from Happy Cow that there was a vegan-friendly cafe there. After a short train ride and a long climb up 365 stairs from the station to the village proper, we were devastated to arrive at 0km and find that they had nothing vegan at all. Fortunately, just a few doors down, we spotted this sign outside Pan e Vin. A great vegan victory! 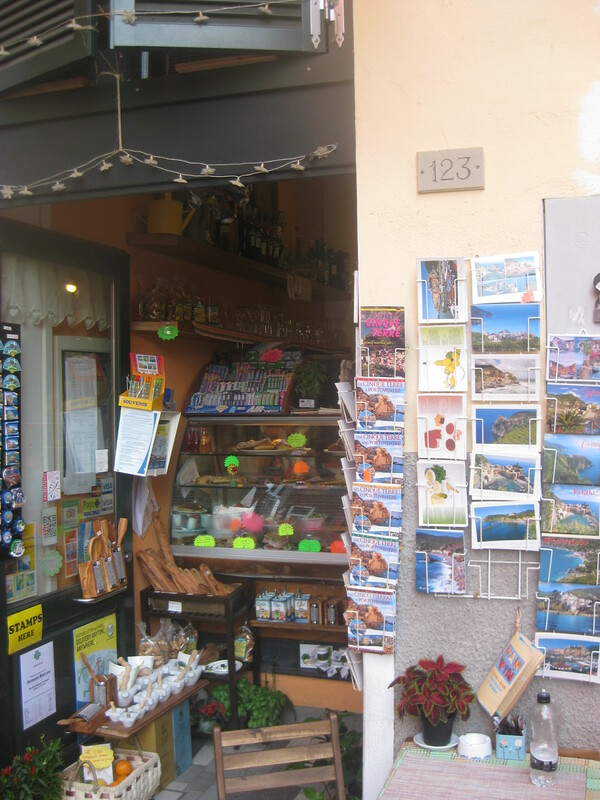 There were lots of jovial old Italian men inside, but the woman behind the counter spoke good English and was very friendly. There were two tiny tables outside on the main little street through the village. The vegan sandwich was warmed up for me, and it was really, really good. 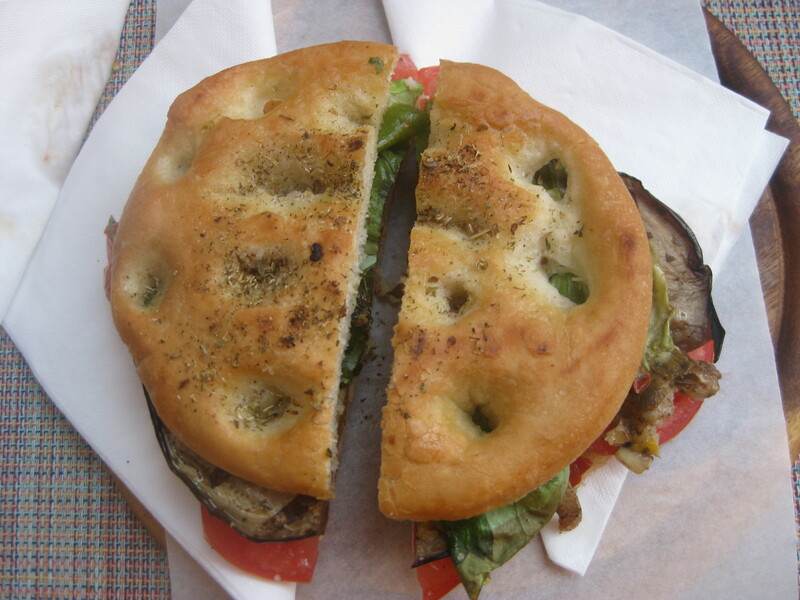 The focaccia was oily and herby, and it was stuffed with roasted artichoke, red pepper, courgette and aubergine, along with some cold lettuce and tomato. It was delicious! It cost €4.50, which seemed pretty reasonable given the size and location of the cafe. This was the only advertised vegan dish, but Dr HH got the bruschette trio and two of them were also vegan if not topped with pesto (and the server checked before putting it on), so this one could also be veganised. 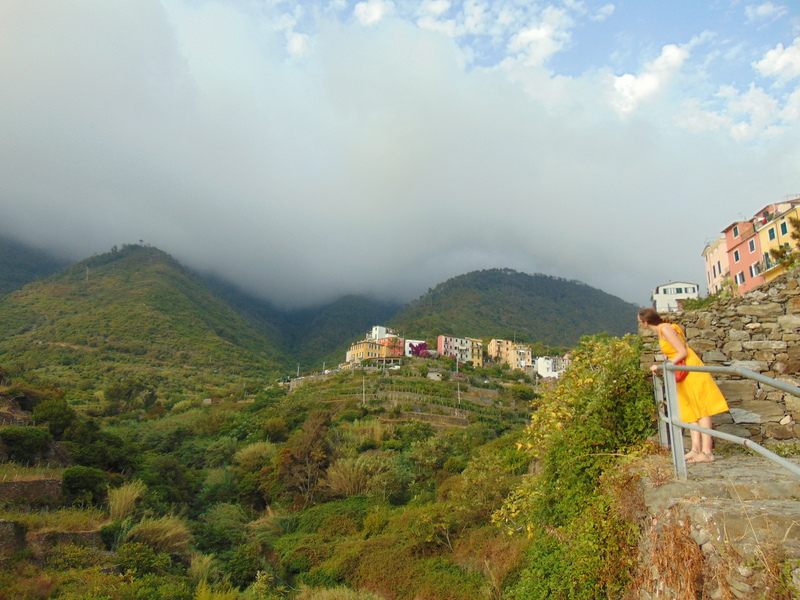 This was a beautiful introduction to the Cinque Terre! 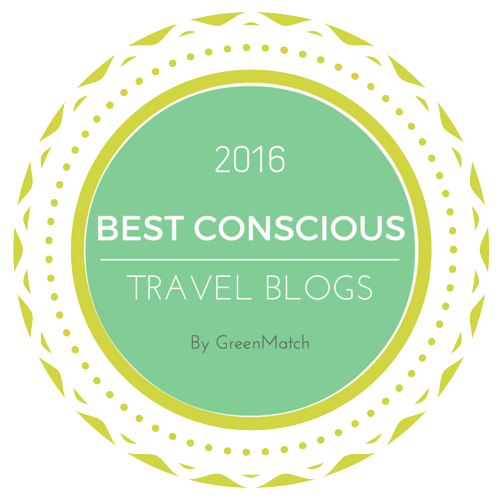 This entry was posted in Travel, Vegan Mofo and tagged Pan e Vin Corniglia, vegan Cinque Terre, vegan Corniglia, vegan travel, veganmofo, vgnmf17. Bookmark the permalink. I would have been so happy to have seen that sandwich after the long walk. If you’re going to have only one vegan dish on your menu, it’s good to see it’s such a good one! Yes, I was just about to go into hangry meltdown so it was the perfectly-timed discovery! Gorgeous photos, including that huge sandwich! Thanks Tracy! It’s a really beautiful place – and sandwich! That sandwich! Now I’m hungry for something not reasonably attainable. Surely it’s worth the flight time! 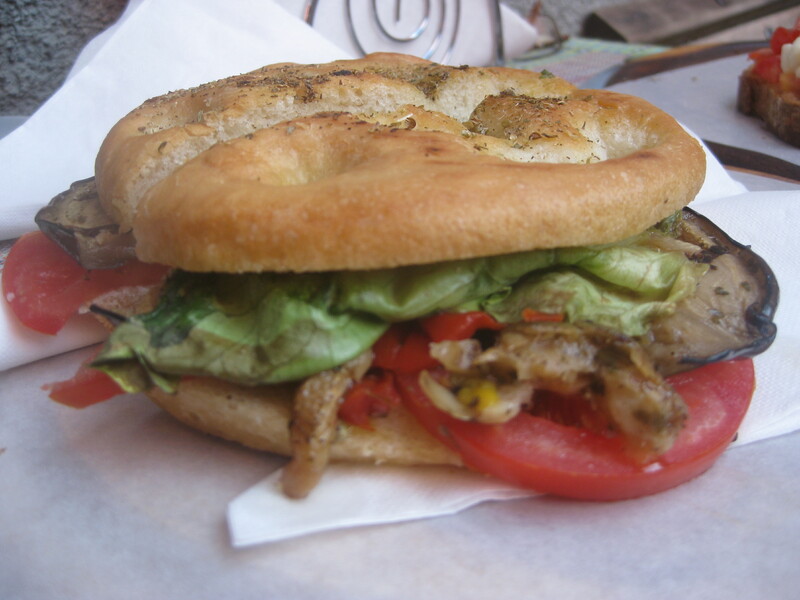 That sandwich looks so good; it’s been a while since I’ve had focaccia! I ate a lot of it while I was in Italy!